This week I was able to be at the last two games of the Kansas City Royals 2012 season. I did this a few years ago, and had a blast, so why not do it again? 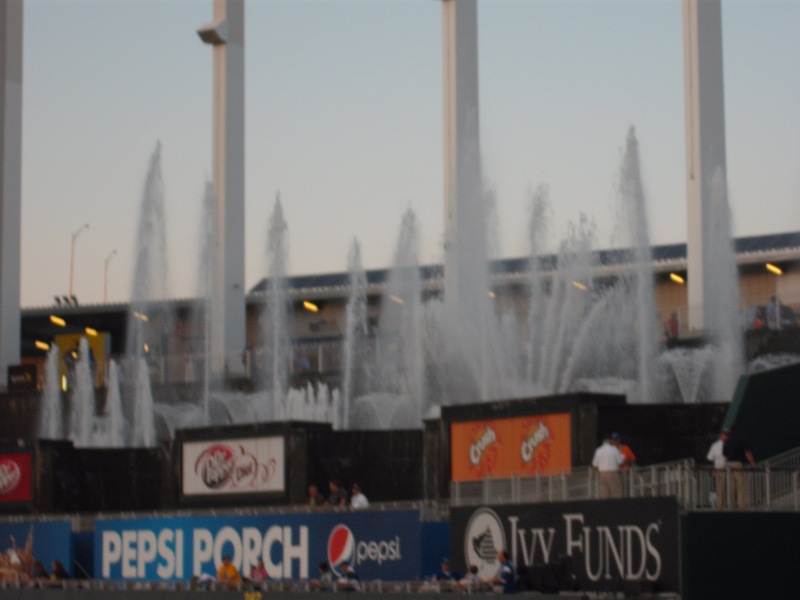 Some people don’t get a chance to really take in the experience of being at the ballpark, so here is a look at two nights of baseball at Kauffman Stadium. Tuesday night I ventured to KC for game 161 on the season. My seats were out in right field, which seemed like a blessing in disguise. There in front of me was a source of scorn for many a Royals fan this season, Jeff Francoeur. My girlfriend instantly asked me if I planned on heckling him, and I couldn’t tell her no. Then we noticed in front of us, a group of Frenchy fans. Yes, somehow they exist…and they looked like this. Yes, people go out in public looking like this. I hate to admit it, but this REALLY made me want to heckle Frenchy. Hey, the guy hit .235 this season. Trust me, he’s earned it. But once the game unfolded, I couldn’t do it. Why, you might ask? Because he actually went out and had a great game. By the time it was all said and done, Francoeur had a single, a homerun, and a great play in Right Field. But, that didn’t take away too much from my enjoyment. The Royals would rally back to win the game, and it proved my theory that any day at the ballpark is a good one. We were in a loud section, but I didn’t let it bother me. I should probably mention that I am normally not a loud fan when at the K. I like to sit and watch the game and how it unfolds, and take in the atmosphere. The game’s atmosphere was great, and at least I was in a part of the stands where people cared and knew what was going on. I go to a lot of games where no one knows anything that is going on, and they spend a lot of the game being loud and drunk. Thankfully, none of that Tuesday night, and with the win it also assured the Royals that they would have more wins than they did in 2011. Hey, you take what you can get. All in all, a fun night and now I was pumped for night two. Now on to Wednesday’s finale. 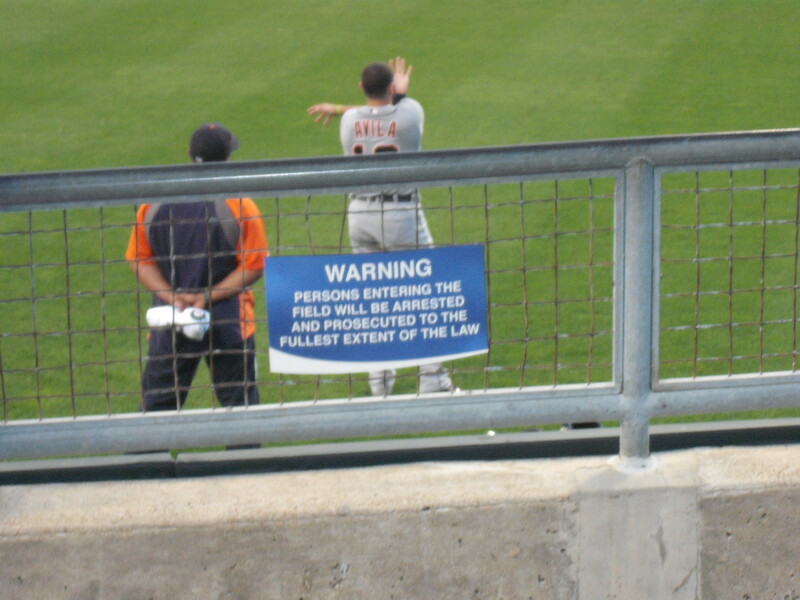 This time, I ended up sitting in Left Field, and was ready to witness a great ending to the season for the Detroit Tigers Miguel Cabrera. Coming into game 162, Cabrera led the league in Average, Homeruns, and RBI’s. That would be the Triple Crown folks, and no player had done it since 1967, when some guy named Carl Yastrzemski did it for the Boston Red Sox. I should mention right here that I was immensely happy that Johnny Giavotella was back in the line up for the Royals, as it seemed like manager Ned Yost was doing everything in his power that last week of the season to play Gio. I needed someone to cheer for besides Alcides Escobar, as my other favorites, Mike Moustakas and Salvador Perez were out of the lineup. This game moved a bit slower than Tuesday’s game, but what we got was a pitchers duel, as Luis Mendoza showed why he has been one of the Royals best starters in the second half of the season. In the fifth inning, Tigers Manager Jim Leyland took Miguel Cabrera out of the game, and Kansas City fans showed why they are a classy bunch. A standing O for Miggy, as these fans realized that he was just minutes away from confirmation of him winning the Triple Crown. It was confirmed just a few innings later, and Royals fans again gave Cabrera a standing ovation, this from a fanbase that was ripped for booing Robinson Cano at the Home Run Derby. Of course, the national media failed to acknowledge this, as why ruin the nations first impression of us. When it was all said and done, the Royals stranded 11 runners on base and the Royals would fall to the Tigers, 1-0. The one negative from my two games at the ballpark was an incident that happened in the 9th inning of Wednesday’s game. While going to the bottom of the 9th, Tigers Left Fielder Quintin Berry saw a little girl wearing a Tigers shirt near the railing in left and threw the ball over for her to catch. Only problem was another guy, probably early 20’s, reached over and snagged it, cheering as if he just did a keg stand. The little girl took off crying, while the jackass acted like he did something special. A number of people told the guy about the little girl, but he didn’t care. I have to admit, this disgusted me. At the end of the day, that ball would mean more to that little girl than it ever would for this selfish prick. Someone else got her a ball, but the damage was done. The fact this guy knew what he did and still didn’t care just shows you how some people don’t “get it”. I remember being a little kid. I would have LOVED to get a baseball at a game from a player. Hell, I still would. But I also realize that those moments mean more to kids than it ever could for us as adults. This jerk took that moment away from a young Tigers fan. I can only hope she doesn’t think all of us Royals fans are like that, because we aren’t. I had a talk after the game with the little girl’s dad, so I really hope they realize that he isn’t a proper representation of the Royals fanbase. 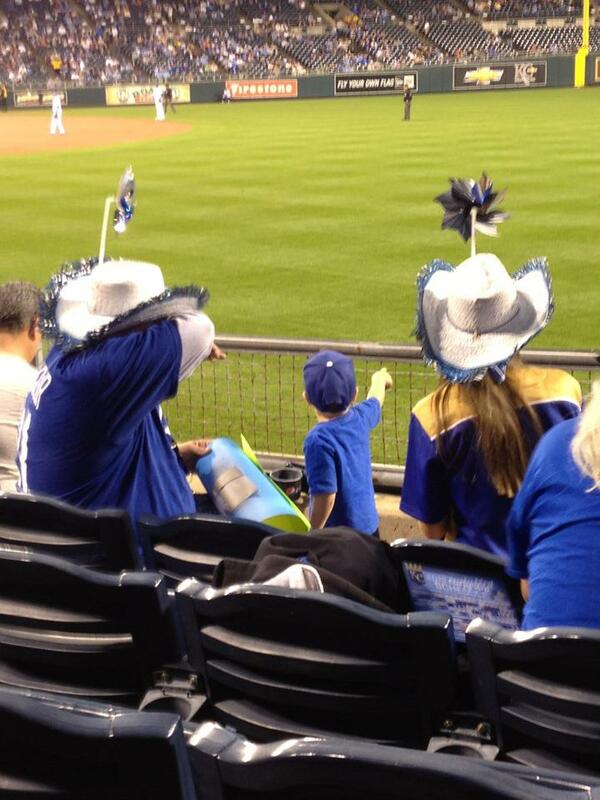 I hope in the future I never see such a selfish act at the ballpark, but I know there is a chance it could. So what did I take away from two game trek to the K? Like always, I had a blast at the ballpark. It will always be my home away from home, the place that brings out the little kid in me. I am a Royals fan, through and through, and am glad I got to enjoy that experience with people I love. About midseason this year, I decided that I as a fan want to see improvement from the team next year, and if that didn’t occur then I wasn’t going to head to the ballpark as much. It really pains me to say it, but we fans need to see a winner. Kauffman Stadium, 39 years later, is still one of the most beautiful ballparks in the majors, and would stack it up against almost any of the newer ones out there today. I will definitely go to a few games next year, but without improvement I don’t think I will as much. Hopefully, a year from now I’ll be talking about how foolish I was to lose trust in this organization and they will bring me more joy than pain. Either way, a night at the ballpark is always a highlight of the year for me. Two straight nights at the ballpark makes for a great story.